A 3D printer is a computer peripheral just like a normal printer, but instead of printing a picture of an object, 3D printers can actually print the object themselves! They can do this because the “ink” inside of a 3D printer is actually plastic and it creates the object layer by layer by responding to commands given by the software.The end product is produced by a process called additive manufacturing. Any solid plastic object that fits within the printer's build envelope can be made. The build envelope is the printable space of the machine. For example, if a machine has a build envelope is 4x4x4 then that means the largest object that a machine can build is 4x4x4. Until recently this amazing technology was only available to large companies and their rapid prototyping departments or sub contractors, but now these exciting machines are becoming available and affordable to the average public. There are several very good hobby level machines like the Thing-o-matic, the Ultimaker, and the Reprap project available now. Unfortunately, most of these machines are only available as complex build-it-yourself kits and have a set, limited build envelope. So right now you can have one of these fantastic machines, but only if you don't mind tediously toying with fiddly parts, and at the end of it realizing that it is too small to handle your ideas. 3D Printing Framework rather than just another Printer kit. The Maxifab 3D Printing Framework aims to address some of the limitations of those other designs. The heart of the framework consists of a set of plastic parts that hold the key functionality of the machine and allows for an almost limitless choice of case materials, designs, and dimensions. Using the Maxifab framework, the end user can build his/her machine from anything ranging from plywood to carbon fiber, and as small as a shoebox or as big as a refrigerator – the build envelope is directly related to the case size. And since the plastics, motors, electronics, bearings, etc are reusable, it is possible to start small and expand later. Realizing that designing a case may not be for everyone, we have designed a complete 3D printer kit with a choice of either laser-cut wood or plexiglass. It has a footprint of 12” x 12.5” x 18”, which is slightly smaller than the Ultimaker but with a similar build volume of 8” x 8” x 8”. We are also designing a larger kit with a build volume of 8” x 18” x 8” to accommodate larger prints. The Maxifab 3D Printing Framework builds on the RepRap project's ideals, but not its design. The Maxifab is probably closest to the Ultimaker in its general principles of design, but not in its mechanics. The Maxifab 3D Printer Framework was designed with a focus on multifunction parts, and a low distinct part count. For example, there are only two parts that make up the “upper gantry support” but each part functions both as a structural corner support for the case as well as a mounting point for key printer components. 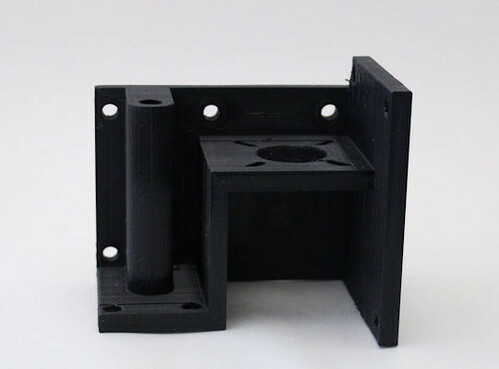 The Maxifab Framework utilizes an XY gantry and floating print head design with a separate hot end and a remotely mounted filament feed mechanism connected via a Bowden tube. The build base moves only in the Z direction, which eliminates any wobble associated with a build base that moves in either the X or Y direction and thus allows for reliable printing of tall parts. 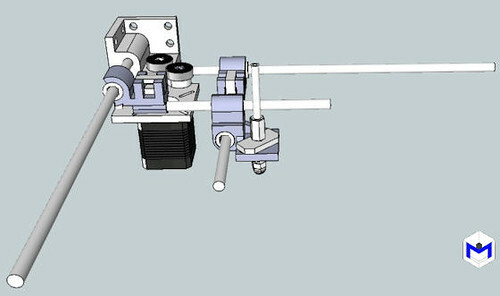 The separation of the extruder motor and the print head allows for a lighter print head, which correlates into faster motion and therefore faster prints. This design also reduces wear and tear on the Maxifab's novel belt-drive system and its motors. In order to keep things simple and alleviate supply-chain bottlenecks, the Maxifab Framework is designed around standard and readily available components such as Nema 17 style stepper motors, sanguinololu electronics, lm8uu bearings, and 8mm precision hardened linear rods. Accessible, affordable 3D printing will allow everyone to turn their ideas into tangible products with ease. Hacker spaces exist in many cities and even some libraries. We feel that, while this is a good start, we would like to have printers available in every school. Not just one or two, but however many are necessary to truly get this into the hands of children and let them experience the feeling of holding in their hand something that only ever existed in their mind. Libraries with 3d printers available to the public are another great way to expose this technology to the masses. Let’s take this further, imagine 3d printers available on demand at any Kinko's or Staples. Design a part at home, bring the file to them on a thumb drive, and have it printed for a nominal fee. These companies already do large scale printing, copying and even offer computer rental for internet access etc. 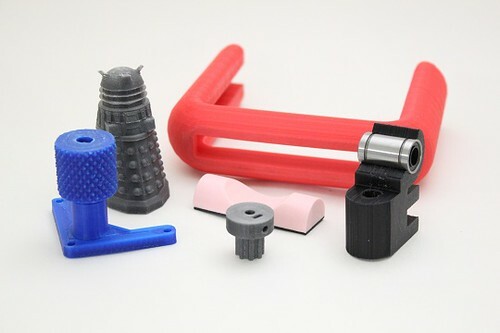 Imagine being an engineering student who can't afford a 3d printer, being able to flesh out his inventions by simply going and having the part printed at his local office supply store. While this may sound a bit farfetched, this could easily happen. Not necessarily 3d printers everywhere but the ability to easily go from thought to design to finished product in a cost effective way. Imagine the flood of creativity this could usher in. The next generation of kids need not be limited to just wood shop and metal shop. Let’s add desktop manufacturing and the necessary tools to the curriculum. That kind of future is what we envision, and with your help, perhaps we can make some impact on the future and the future of our kids. Let’s bring into being the next generation of kids that don't just want to buy what they want, but can make the things they want. Let’s help them become Makers and not just consumers. Plus, 3D Printers are just cool. Designing in 3D only takes time, but converting those plans to reality takes money. Once a part is designed it must be tested, modified, and tested again several times to optimize the part before releasing it into production. To do this we need, ironically, a 3D printer to be able to manufacture prototype parts. We also need to purchase the other components such as the control electronics, motors, and bearings to test the system as a whole. Once the plastic components are production-ready, we eventually intend to have tooling made to allow for the parts to be injection molded to drastically reduce cost and production times. Doing it this way will allow us to sell the kits at a very affordable price so that everyone can enjoy 3D printing at home. 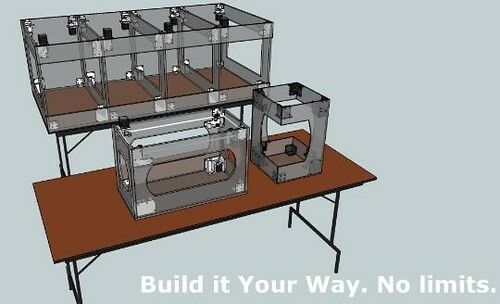 Once the Maxifab's design is finalized and things are going strong, if our funding goal is reached we will release the parts files into the wild on www.thingiverse.com so that anyone with access to a 3D printer can make their own parts and enjoy the elegant and expandable design of the Maxifab 3D Printing Framework.